Pressing garden flowers is a wonderful way to preserve the beauty of summer and spring. We discussed how to press flowers in our April 2013 posting on ‘Pressing Wildflowers’, which can be accessed at http://mother-natures-backyard.blogspot.com/2013_04_01_archive.html Spring and summer can be busy times in the garden. With the coming of fall, you may finally have time to put your pressed flowers to use. A simple craft idea uses pressed flowers to make colorful bookmarks. These unique and useful gifts are easy to do if you have access to a laminating machine. 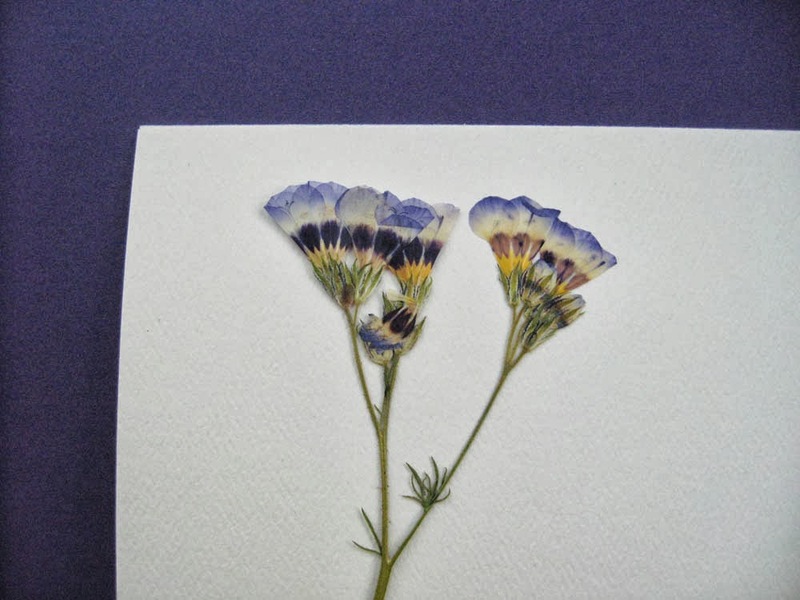 The flowers used for making laminated bookmarks need to be thin and pressed very flat. Look through your collection of pressed flowers for ones that are attractive and the right size – about 2 by 5 inches is a good size. For background, choose a paper that complements your pressed flowers. A wide range of papers are available wherever scrapbooking supplies are sold. 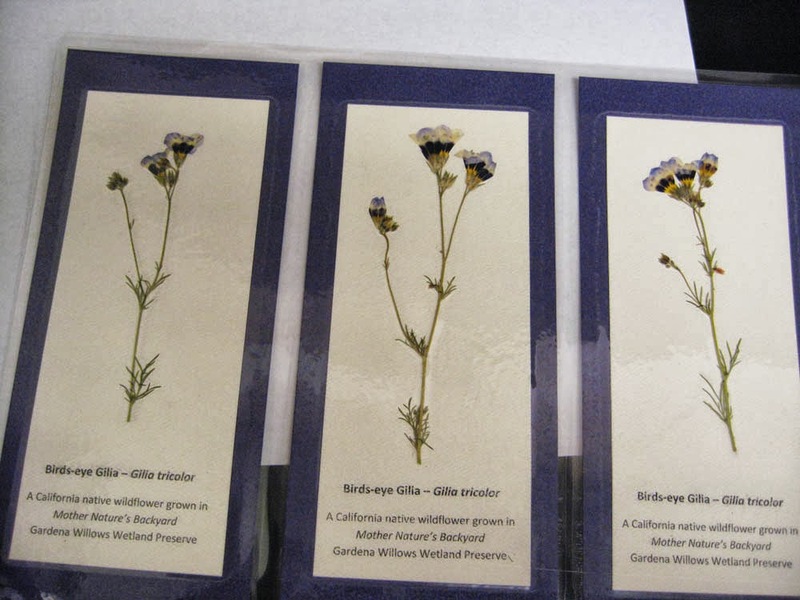 We used pressed Birds-eye Gilia flowers (a native wildflower) for our bookmarks. We selected a light cream and dark purple papers for the background, because they bring out the colors of the flowers (see above). After trying the flowers on both backgrounds, we decided to use the cream as background with purple as border. 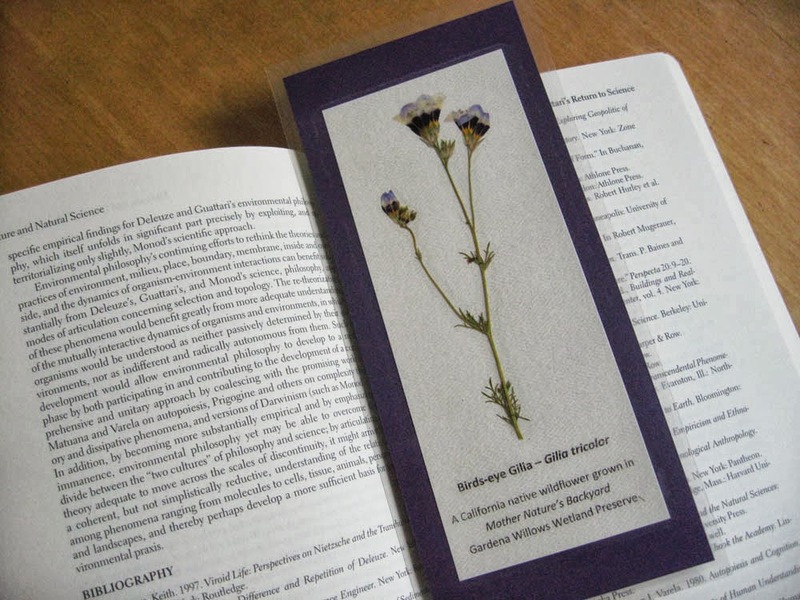 You can make your bookmark using only pressed flowers, but we like to include a little information on our bookmarks. This is easy to do. 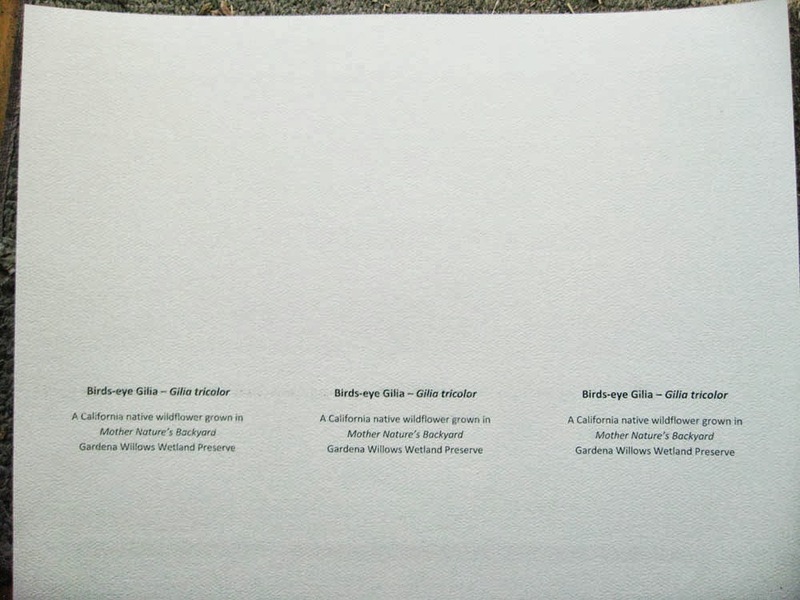 If you’re talented, print the information by hand; if not, use your computer to print the information on a light-colored background. You can make 3 bookmarks from an 8 ½ x 11 sheet of paper – printed horizontally (set the page layout to 3 columns). For our bookmarks, we included the common and scientific name of the flower and where it was grown (see below). Cut out the bookmarks to the correct size. We cut our inner background to 2 3/4 by 6 ½ inches and the outer background (purple) to 3 ¼ by 7 ½ inches. If you scrapbook, you likely have punches or edge-trimmers to make your borders even more decorative than ours. Carefully assemble the bookmarks in a laminating pouch, being sure that all edges are straight. Run the pouch through the laminator, following the manufacturer’s operating instructions. Cut the bookmarks apart, leaving a ¼ inch laminated strip on all sides of each bookmark. If desired, punch a hole in the top of the bookmark and insert a ribbon or cord. That’s all there is to it! If you’ve followed this series from the beginning (July 2013), you’ve come a long way towards designing your New California Garden. You know your garden site quite well; you’ve drawn a site map (map of the area) and determined the characteristics that make your site unique. This basic preparation work – which takes some time – is worth the effort in the long run. If you haven’t seen the previous postings, we suggest you begin with the July posting: Designing Your New California Garden: 1. Why Plan? At this point the real fun begins – you start thinking about what your garden will actually look like. The first step is to imagine the activities and functions that you’d like to take place in your new garden. This is important: you want a garden that supports the outdoor activities you enjoy. Another important aspect is defining the water goals for your garden. Once your goals are clear you can design a garden that’s water-wise, life-friendly, functional and beautiful. What is a Landscape Functional Analysis? The landscape plan for your New California Garden should reflect the types of activities you need and want to do in your garden. The first step is to list the types of functions you’d like your garden to serve. Some functions will be purely practical – for example, a place to put the trash cans, the clothesline or a compost bin. Other functions will reflect your family’s recreation and leisure time activities – e. g. a play place for the children, a quiet meditation area or a place for outdoor dining. The time to think about these functions is now – before you design your Landscape Plan. That way you’ll be sure to include a place for important activities in your design. 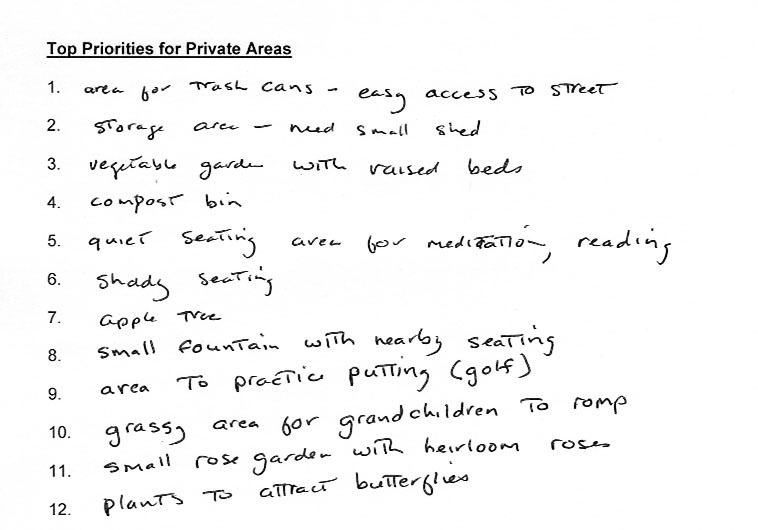 A good way to start is by listing all the possible functions your garden might serve. At this stage we suggest that you put down every function you might want to include – you will prioritize and ‘prune’ your list later. Just take a blank sheet of paper and start listing. We suggest that you work on your list over several weeks; it’s important to list everything you might want to include in your plan. Think about all the features you’ve wished you had in your current garden. What activities are difficult to do in your current garden? Consider home and public gardens you’ve visited and liked. What activities were possible in these gardens? Were there specific features that ‘made’ the garden – for example a fountain with nearby seating for summer relaxation? A ‘functional area’ that included trash bins, clothesline, potting bench and similar functions? An attractive entry way with tasteful plants and statues leading to the front door? Garden art? Did the garden have a place for growing vegetables or fruits? Use areas for family pets, such as open lawn, dog run, etc. Outdoor needs for cooking, sun bathing, lounging, reading. What size and types of outdoor entertaining areas are needed? What types of recreation areas are needed (pool; croquette; etc.)? What are the outdoor storage needs for equipment, firewood, vehicles or boats? Do you need a potting bench or other area to make garden tasks easier? Do you want to include water features like ponds, streams, fountains? Where do you need pathways/walkways? Will they be for walking only, or will you need to move equipment (like trash barrels) over them? Do you wish to devote specific areas of the garden to habitat for birds, butterflies and other wildlife? Do you need to provide shade in some areas? Would your yard benefit from a windbreak? Do you need a ‘fire retardant zone’ around buildings? Would you like a quiet sitting or meditation area? As you work on your ‘Needs and Dreams List’, also look at the section on Water Goals, below. Complete the Water Goals Questionnaire. Add any Water Goal priorities to your ‘Needs and Dreams’ list. Once you complete your list, it’s time to get down to reality. We suggest that you take a good hard look at your list. You’ll probably find that some items can be deleted; others may be redundant. Once you’ve pared down your list, divide your needs/desires into two groups: those related to public areas and those related to private areas of the garden. You may find it helpful to high-light the two groups with different color high-liters. Next you need to prioritize your Public and Private Space Lists. Use the Functional Analysis Worksheet (http://www.slideshare.net/cvadheim/functional-analysis-worksheet) to list up to 25 of your top priorities from each list. 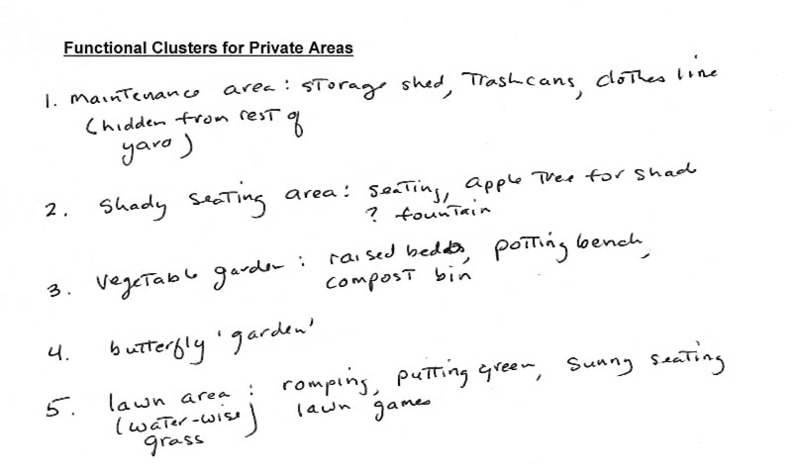 Look at each list and see if any of the functions cluster together logically (for example: a vegetable garden, compost heap and grape arbor). List your functional clusters on the Worksheet. We’ve included some exmple worksheet pages below. The next step (October 2013) will be to place your functional clusters on a copy of your Base Map 2. Those of us in dry regions are thinking a lot about water this year. We’ve gotten less than half the normal seasonal rainfall in our part of Southern California and that’s really dry! You may be considering water-wise plants or other water conservation measures. But first you need to have a plan. Successful gardens – like any successful project – are easier to achieve if you start with a good plan. Using water efficiently is particularly important for those living in mediterranean and desert climates. The era of cheap, plentiful garden water is coming to an end for many of us. We need to get by on less – whether by choice, rationing or cost. Getting by on less does not mean our gardens will be drab, brown and ugly. But it does mean that we need to prioritize and use our garden water more efficiently. A good first step is to determine the water goals for your garden. We can help, but you alone can define goals best suited to your garden, your budget and your way of life. Water goals must be acceptable to everyone in the family, so setting water goals should be a family project. We think you’ll find it fun and useful to think creatively about your garden water budget. With planning, you can use water in high priority areas (vegetable garden; seating area; front entry; etc.) and decrease use in low priority areas. If you don’t yet have a garden map, we suggest drawing one at this point. For pointers on drawing a garden map see our July 2013 posting. Make a copy of the map to use in determining your water goals. You’ll be indicating certain areas on the map as you define your water goals. 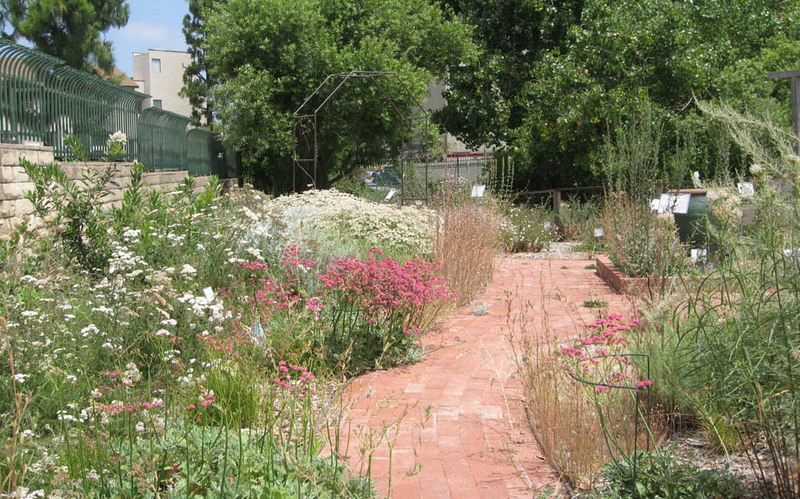 We’ve developed a Water Goals Questionnaire that we use in teaching water-wise garden design classes. This gardener-tested questionnaire has helped others understand their garden water use, soil water patterns and irrigation needs. The questionnaire will get you thinking about ways to use water more efficiently. As you go through the questionnaire, you may also want to review posts in our series on ‘Harvesting Rain’ (January through June, 2013). We think you’ll find the ‘Water Goals’ questionnaire (http://www.slideshare.net/cvadheim/your-water-wishes-questionnaire) useful in setting your water priorities and goals. It covers topics you might not have thought about before – like defining areas that could be left ‘summer dry’. We suggest you fill the questionnaire out in pencil, because you may want to reconsider your answers as you go along. Take your time filling it out. The Water Goals Questionnaire is meant to get you thinking – and discussing – what you want your garden to look like in the future. Add any important Water Goals to your ‘Needs & Dreams’ list. 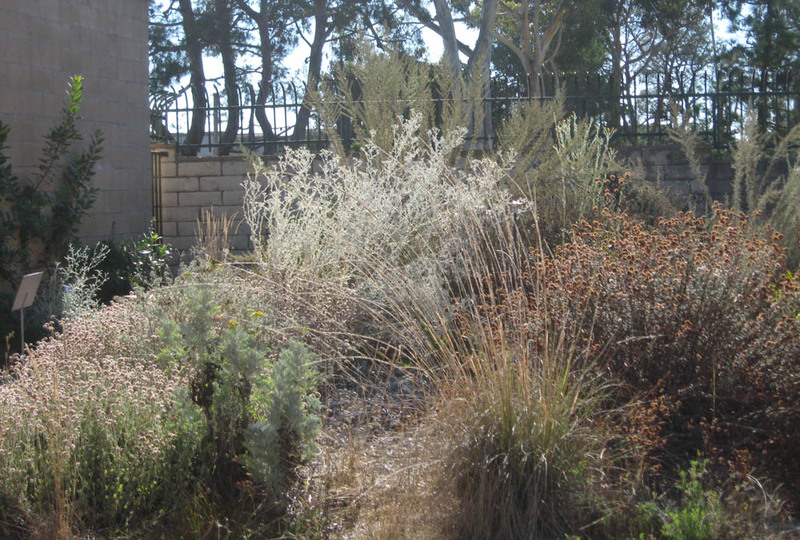 The native plants of western Los Angeles County include a number of species with pale green, gray and white foliage. These plants provide welcome texture and color to local gardens; one could design an interesting garden based on foliage contrasts alone. One of the lightest colored foliage plants is the Felt-leaf Everlasting, Pseudognaphalium canescens. It’s blooming now in Mother Nature’s Backyard. Our local subspecies, Pseudognaphalium canescens ssp. microcephalum, is common from central California to Baja California, Mexico. 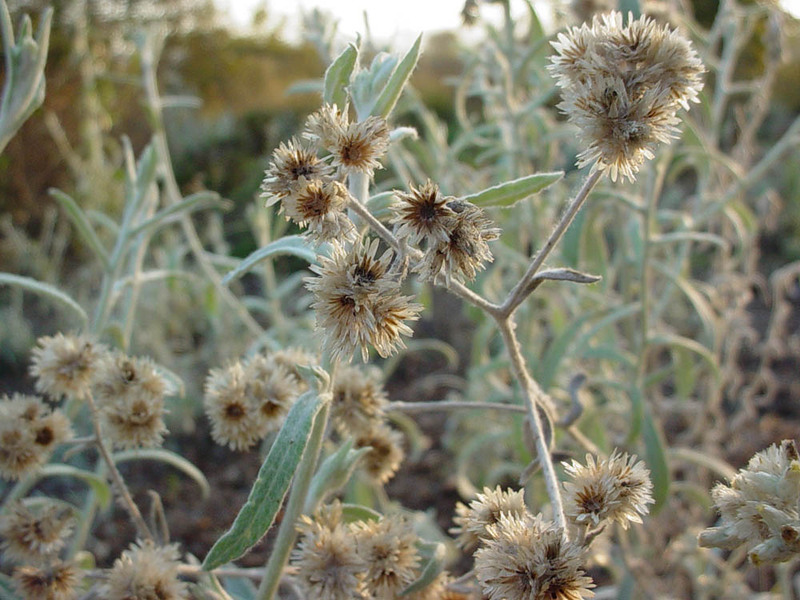 It usually grows in the southern coastal prairie, chaparral, coastal sage scrub, and southern oak woodland plant communities, on dry slopes and other open spaces at elevations under 4000 ft. Several other subspecies are found throughout California, including in the San Gabriel Mountains of inland Los Angeles County. Felt-leaf Everlasting is a biennial or short-lived perennial in our area. It grows in a mounded to spreading shape of 2-4+ ft. tall and wide. The stems are primarily stiff but not woody and the foliage has little fragrance. The leaves are alternate, simple and lance- or spoon-shaped, becoming smaller near the tips of stems. The most conspicuous foliage feature is its color, which ranges from pale green to almost white depending on light conditions and time of year. 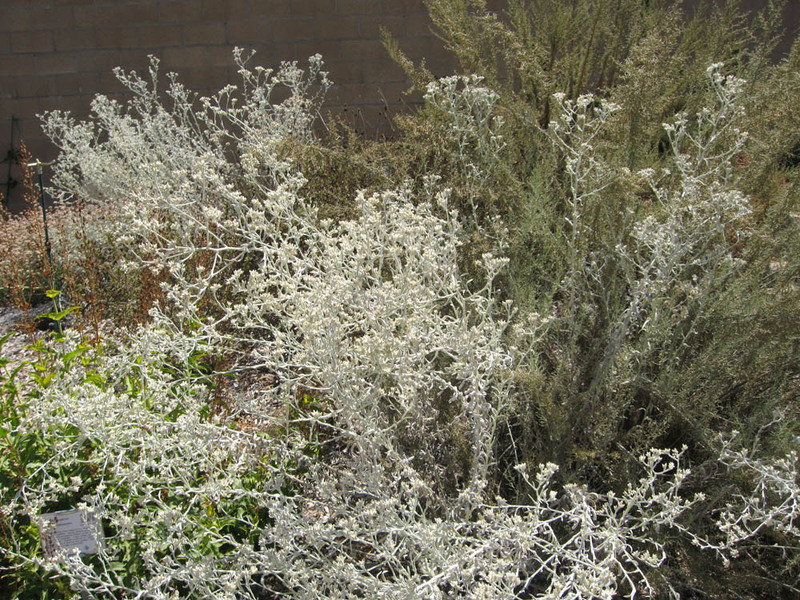 The light color is due to dense white hairs which cover the leaves and stems (see photo below). The hairs are efficient at harvesting moisture from fog, as seen in the photo. The flowers are typical for local native Everlasting species. The flowering heads, which contain a number of flowers, are narrow and located primarily at the ends of branches (see photo above). Flowering can occur anytime from summer through fall. Similar to other plants in the Sunflower family, Felt-leaf Everlasting has two kinds of flowers: yellow-green disk flowers (most conspicuous) and small ray flowers. The flowers are pollinated by small insect pollinators, primarily native bees and flies. The seeds are small and distributed by wind. 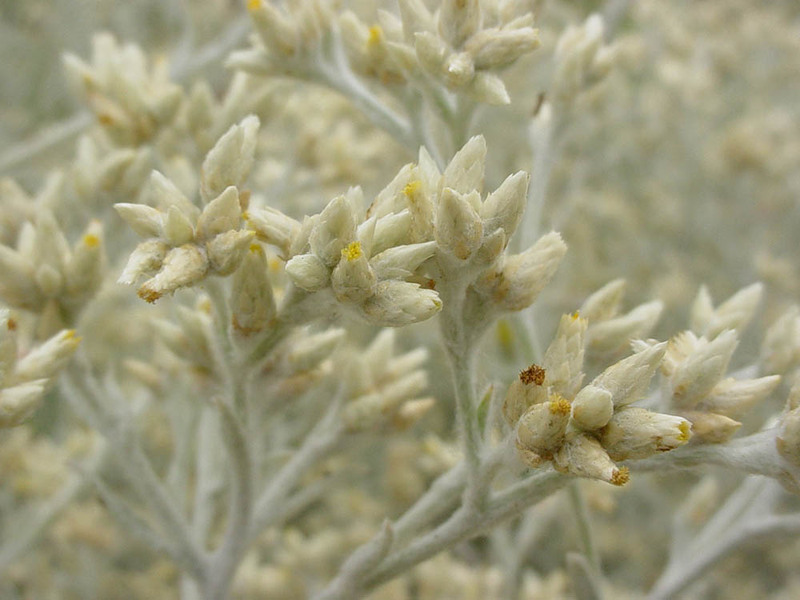 The dry bracts remain on the stems for months – hence the common name ‘Everlasting’. They can be used for floral arrangements. Felt-leaf everlasting does well in full sun or part-shade. It grows in a wide range of soil textures and tolerates soils that range from slightly acidic to alkali (pH 5.0-8.0). It needs winter/spring moisture, but then is very drought tolerant. An easy plant to grow, it will re-seed in most gardens. Mature plants die after 2-3 years and are easily removed in the fall/winter and unwanted seedlings can be removed in spring (you’ll know them by their distinct white color). Count on this plant ‘moving around’ in your garden over time. Felt-leaf Everlasting is often planted for its foliage color. 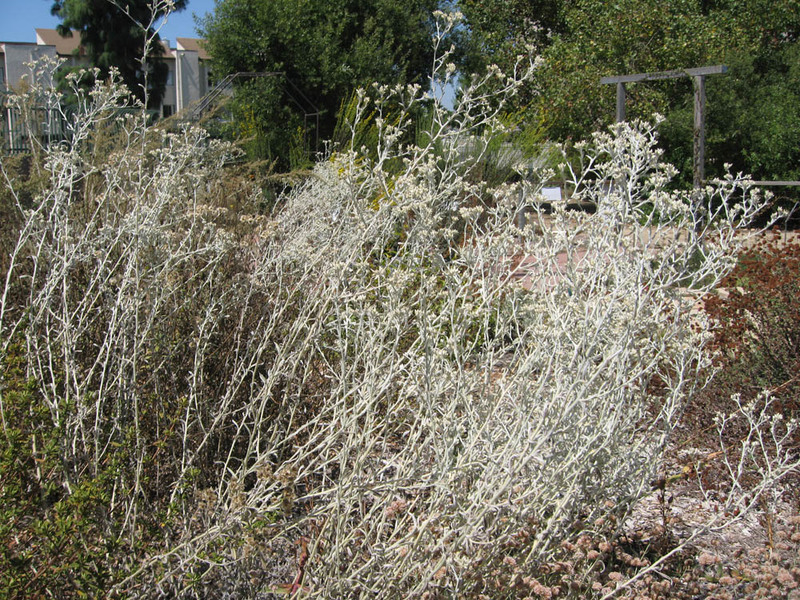 It complements other silver-colored foliage plants and looks particularly nice with the russet tones of fall Buckwheats. The white foliage looks fresh with spring wild-flowers and grasses. The plants will grow around shrubs, filling in open spaces with their airy foliage. 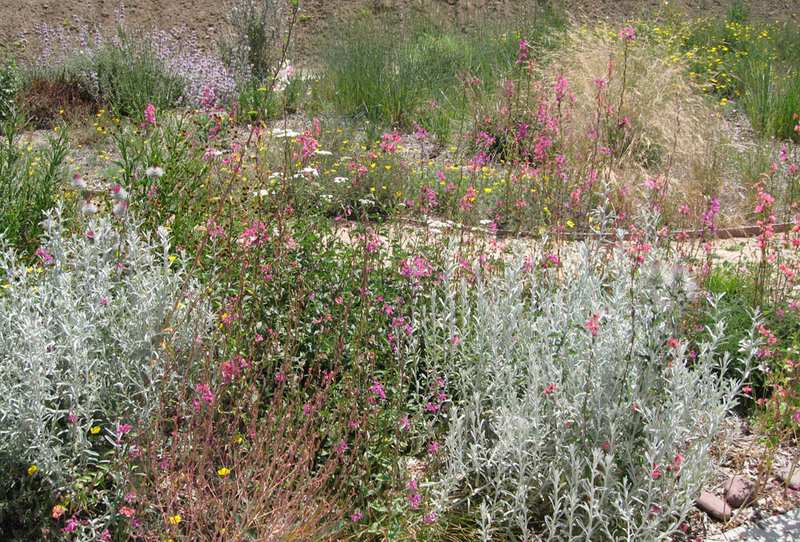 An added benefit of planting Felt-leaf Everlasting (and other Everlastings) is its habitat value. The foliage is an important food source for the American Lady butterfly (Vanessa virginiensis), a frequent visitor to local gardens. Careful inspection of the foliage will tell you if caterpillars are present. 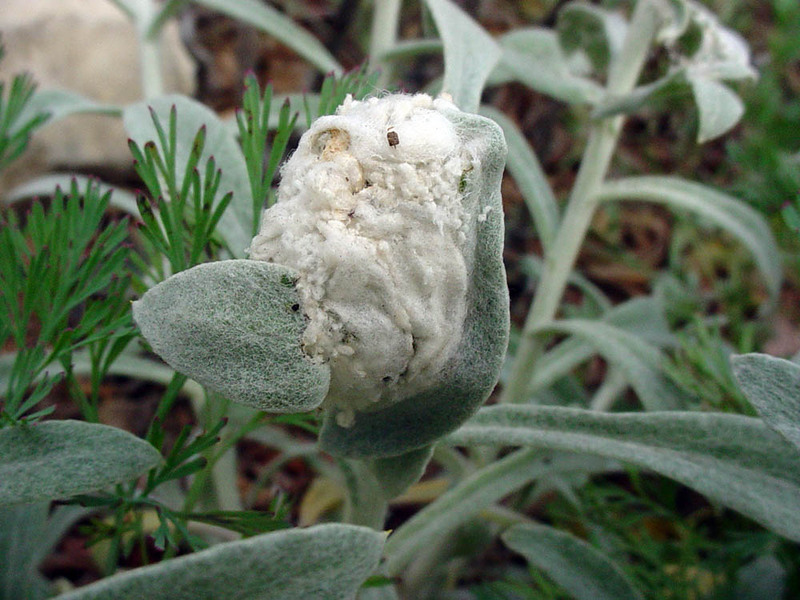 They build distinctive larval nests from leaves and fuzzy hairs (see photo below). Larvae hide in the nests during the day, emerging at night and on cloudy days to feed. 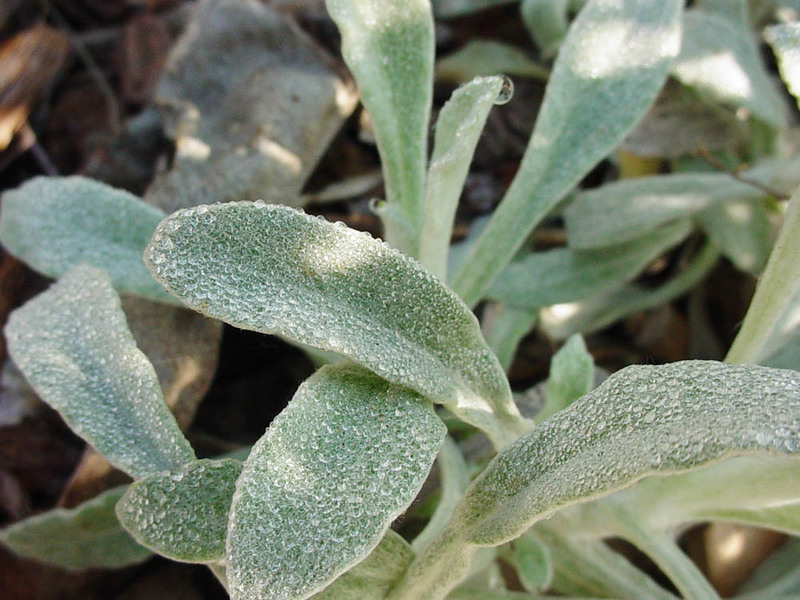 Felt-leaf Everlasting was formerly used as a cold remedy by Native Californians. The dried, powdered leaves were usually inhaled, although a tea from the leaves and inhaled steam from this tea were also used for colds. Crushed leaves were also used as a poultice or liniment for skin wounds/sores.